Champion PT and Performance is a team of performance-based physical therapists and strength coaches located in Boston, MA. Our world-renowned team offers an integrated approach to physical therapy and training designed to help people optimize their performance. Don't live near Boston? No problem, you can still follow our acclaimed online training programs and be part of our #TeamChampion online community. Join #TeamChampion and "Look, Feel, Move, and Perform Like a Champion." Sign up for a group training membership to receive workouts specific to the group! All workouts are available on the Web, iPhone, & Android apps with workout logging and performance tracking benefits! TRAIN LIKE A CHAMPION. NOW ONLINE. 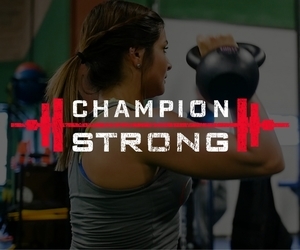 Champion Strong, our flagship online training program, is designed for people that are unable to train with us in-person consistently, but want to follow our acclaimed training programs. © 2019 Champion Online All rights reserved.